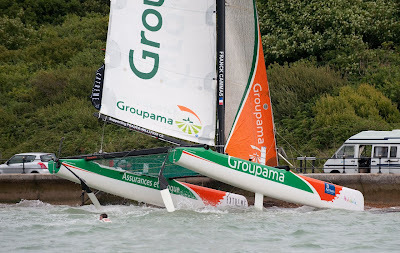 Team Groupama crashing into the sea wall at Cowes. In race 11 (the fourth inshore race of today), approaching the windward mark Yann Guichard’s Groupe Edmond de Rothschild hit Franck Cammas’ Groupama 40 wiping out both rudders, leaving Groupama with no steerage whatsoever. Groupama 40 were heading straight for the shore at speed and for safety the crew leapt into the water to avoid the impact of hitting the rocks – deciding they would prefer getting wet than being thrown forward on the boat and potentially injuring themselves. Groupama 40 has sustained both rudder and daggerboard damage and it will be a long night for the shore team to get them back racing tomorrow. Groupe Edmond de Rothschild has lodged a protest which the jury will hear and award redress if relevant. Yesterday, British skipper Mike Golding said he didn’t mind if they didn’t score any ‘bullets’ today, stating finishing inside the top four was more important. But his helm Leigh McMillan and the crew had other ideas – posting a win in the offshore race in the morning, then two further bullets in the penultimate and ultimate race of the day to finish in second place with 80 points. This kept the home crowd, who packed into the Extreme Bar and along the shoreline, happy as they cheered Golding’s crew all the way. Double Olympic Gold Medalist Roman Hagara had another day of mixed fortunes – one race win and a second place in the penultimate race, keeps them in contention in the middle of the leaderboard in 6th place, five points behind Mitch Booth’s The Ocean Racing Club who did well in this morning’s offshore finishing in second. Another frustrating day for Roland Jourdain’s Veolia Environnement who had rudder problems before the start of the first race then had to drop the mainsail between races to sort out another problem. The team unpracticed in the art of Extreme 40 racing, put a reef in early and raced cautiously throughout the afternoon, although the 1989 Formula 40 World Champion demonstrated why he clinched that title with a couple of great starts.